These cookies, which are the Italian version of shortbread, are rich and sinfully delicious. Serve them with coffee or after-dinner drinks. It is important to bake the cookies until they turn golden brown, as under baked shortbread does not have the same flavor. Also, use the highest-quality chocolate you can find for dipping the cookies – the effort is well worth it. Reprinted with permission from The Puglian Cookbook by Viktorija Todorovska, photos by Michael Potts, Agate Surrey, 2011. In a clean mixing bowl, combine the flour, sugar, salt, and butter. Mix until the ingredients are combined and the mixture is crumbly. In a separate clean mixing bowl, combine the egg, egg yolk, vanilla extract, and lemon zest, and lightly beat with a fork. Add the egg mixture to the flour mixture and beat with a mixer on low speed for about 2 minutes, or until a dough forms. Turn the dough out onto a lightly floured work surface. Dust your hands with flour and knead the dough for about 1 minute, until it is smooth. Wrap the dough in plastic wrap and chill for at least 1 hour (and up to 4 days). If you chill the dough for longer than 1 hour, let it warm slightly before rolling it out. Roll the dough out onto a lightly floured surface. Cut out cookies using a cookie cutter or the rim of a glass. Place the cookies on an ungreased baking sheet and bake for 10 to 12 minutes, or until the edges turn golden brown. Remove the cookies from the baking sheet and cool on a rack for at least 15 minutes. In a double boiler, gently melt the chocolate. When it is completely melted, remove the chocolate from the double boiler, place it in a bowl, and let it cool for 2 minutes. Line a cool baking sheet with foil. Place the slivered almonds in a bowl. Dip half of each cooled cookie in the chocolate. 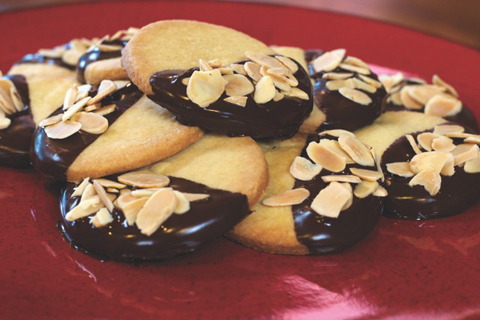 Roll the dipped half of each cookie in the almonds. Place the cookies on the lined baking sheet to set.